Robin the Ixi and his adopted sister Sunset the Zafara, a pair of pets living a forest near Shenkuu, sat in a cave, watching the rain outside. Their suburban section of Shenkuu containing their owner's Neohome was not far from there and the rainfall was comparatively light; most pets would have simply braved the weather. I interviewed Jhudora on her day to review the Illusen Glade rewards. With it being Illusion Day I thought it would be only fair to have Illusen do the same with Jhudora Bluff rewards! I asked Illusen and she was quick to agree, seemingly eager in wanting to talk about Jhudora’s rewards. Having a dramatic change in physical appearance can be incredibly stressful for anyone, but even more so when those physical changes come along with changes in ability. 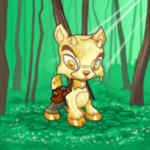 If you’re reading this, you (if you’re a Neopet) or your pet (if you’re something else) has recently been painted Ghost! You may be wondering, what does this mean for you? “Nooo, Sarina!” Torin called desperately. His friend teetered precariously on the brink of the pit. Her hands grabbed fistfuls of air. But it was futile really. She fell all the same.